The burden rests with Cameron Norrie and Dan Evans as Great Britain attempt to secure a seeding ahead of next year's qualifying round. 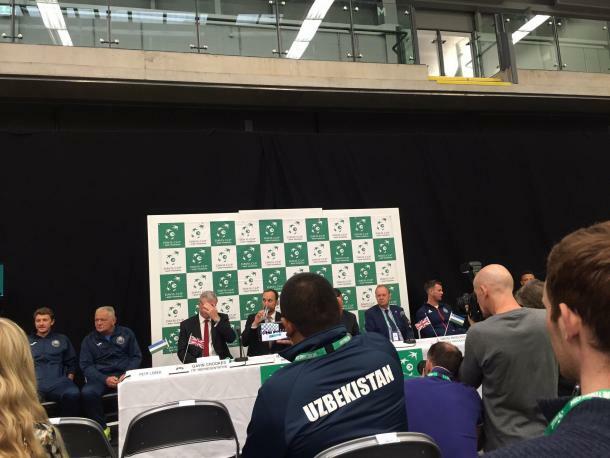 Great Britain’s five-year stint in the Davis Cup World Group may not be under immediate threat considering the current structure is set to be revamped heading into next year’s edition, but they will not like to envisage a scenario where they head into next February’s qualifying round as an unseeded proposition. That could very much be the case if the 2015 champions take the threat of Uzbekistan lightly, spearheaded by the world number 60 Denis Istomin, the highest seeded singles player who will line up at the Emirates Arena in Glasgow this weekend. Istomin will be chasing his 50th Davis Cup victory this weekend and a clean sweep of his singles rubbers will see him achieve that target. And he will certainly be confident after a productive summer in which he has won gold in the men’s singles at the Asian Games, reached the final of the ATP 250 event in Kitzbuhel and collected his first title of the season in Chicago last week. He will also relish squaring up to a diminished Great Britain side, bereft of the quality of Andy Murray and Kyle Edmund. However, the top-seeded singles player among the British outfit, Cameron Norrie, poses an immense threat. His development in the last 18 months has been to the benefit of captain Leon Smith, who will have no doubts over Norrie’s ability to lead Great Britain over the weekend. The 23-year-old boasts a 17-12 record on hard courts this year with semifinal showings in Los Cabos and Atlanta in the last two months and any Davis Cup jitters were soothed when he shocked Roberto Bautista-Agut in five sets in Great Britain’s previous tie against Spain earlier this year. Such has been his development and subsequent rise into the top 70 that he will be the highest seeded British singles player this weekend and that, naturally, increases expectation levels. He will have to wait, though, as Dan Evans kicks off proceedings for Great Britain on Friday. He will start as underdog against Istomin yet if this tie were to be played 18 months ago the pre-match odds would have very well been reversed. Evans’ drugs ban has been well-documented and Smith’s decision to go with the former world number 41 raised a few eyebrows considering Jay Clarke’s ability. He will be keen to prove those doubters wrong but he can nonetheless take solace in the tennis he has produced since his comeback. After near misses at the Surbiton and Nottingham Challengers, Evans produced a career-highlight week at the Vancouver Open last month, coming through qualifying to win seven matches in a row before seeing off Jason Kubler in the final to take home his first title since his comeback. That was the culmination of four months of toil, dating back to the first tournament he featured at since his ban expired, not too far away from the venue in which he will play Davis Cup action this weekend. Evans says he did not expect to be back in the Davis Cup fold so soon. 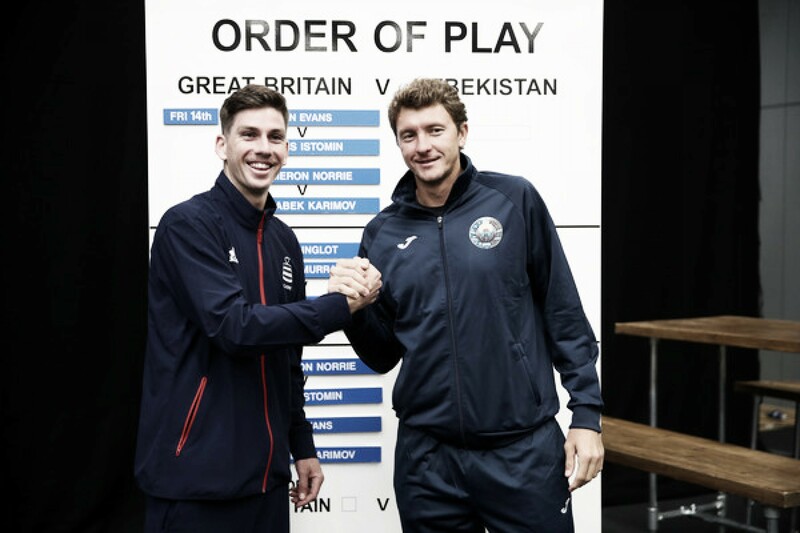 There can be few doubts that Great Britain possess the greater depth this weekend, but the luck of the draw has thrown up the Uzbekistan number one against Great Britain’s number two on the opening day of proceedings and as such the doubles rubber will prove decisive. Great Britain have lost their last two doubles rubbers – against Spain and France – but Jamie Murray and Dominic Inglot are a tried and trusted duo. Both featured and proved instrumental during the side’s triumph in 2015. Smith was at pains to emphasis as much. The atmosphere during doubles day on Saturday promises to electric, regardless of whether the tie swings in one direction on Friday, and the boisterous Scottish fans will make sure they show the decision makers at the ITF – who recently sealed the fate of the home and away element of Davis Cup – exactly what they have killed.